Have you read the Geraldine Brooks book Year of Wonders: a Novel of the Plague ? 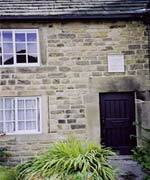 It is based on the very real story of Eyam. This Derbyshire village is famed for its voluntary quarentine of 1665-65, avoiding the spread of plague to neighboring towns. The descendents of the Eyam survivors are of great interest today because they exhibit a high frequency of a genetic varient that may, or may not, confer some immunity to bacterial invasion of white cells. Does digging up old plague sites cause a return of the plague? According to the CDC FAQ on plague the Yersinia pestis bacterium is quite short-lived in the absence of a host, but Mark Twain popularized the idea of its long-term survival. In Life on the Mississippi he cites a secondary source "'In 1828 Professor Bianchi demonstrated how the fearful reappearance of the plague at Modena was caused by excavations in ground where, THREE HUNDRED YEARS PREVIOUSLY, the victims of the pestilence had been buried. Mr. Cooper, in explaining the causes of some epidemics, remarks that the opening of the plague burial-grounds at Eyam resulted in an immediate outbreak of disease.' --NORTH AMERICAN REVIEW, NO. 3, VOL. 135." (The Library of Congress is making digitized versions of the North American Review available online and you can read the article Twain cites: Earth-burial and Cremation The North American review. Volume 135, Issue 310, September 1882.) We even have a novel based on the premise that artifacts from plague years are themselves dangerous. FIC BENSON The plague tales. FIC DEFOE A journal of the plague year Defoe's classic. 614.573 ORENT Plague : the mysterious past and terrifying future of the world's most dangerous disease Wendy Orent. 614.573 KELLY The great mortality : an intimate history of the Black Death, the most devastating plague of all time John Kelly. Forever Amber by Kathleen Winsor. Great trashy romance and the first banned book many of us read. Unfortunately we don't have a copy in the library but the DC, Montgomery and PG library systems own copies. What about Pepys? Our copies of the Diary are missing. We will replace them. It is available online. PubMed article on the sequencing of the bacteria has the wonderful phrase "redundant enteropathogenic lifestyle"